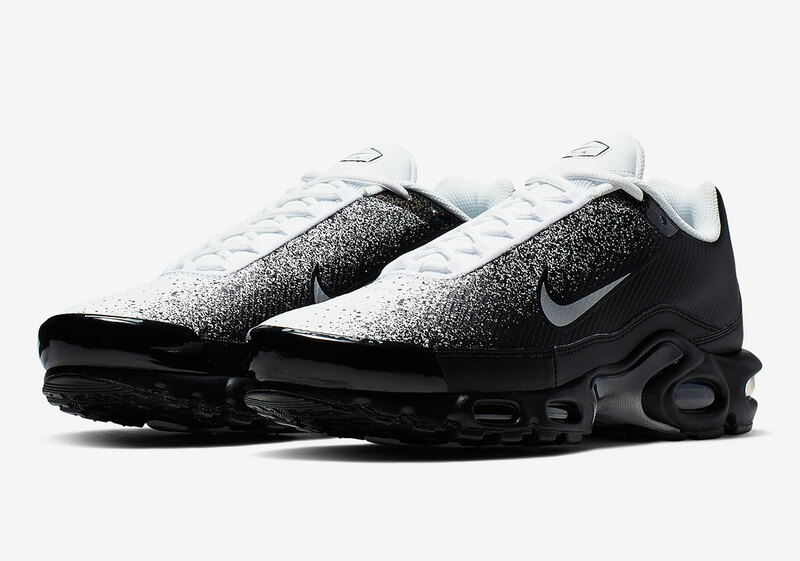 Though always a staple within European fashion subcultures, the Air Max Plus stays relatively quiet stateside with Beaverton slowly attempting innovation with new toolings like their avant-garde “Spray” motif, which is now set to arrive in a monochrome alternative entirely unlike its more vibrant orange sibling. Synthetic uppers, while more recognized for punchy tones and gradients, boast mostly barren constructions with a black shade paint its upper in close entirety. Sole units, heel counters, mudguards all arrive darkened with abandon, breaking up in scattered execution towards the vamp and tongue for a contrasting hits of a bleach white. Lateral swooshes arrive in metallic finish adding texture aside from the chaotic design, with much of the kit left simplistic in arrangement. Be sure to check out the pair for yourself below and find them rolling out to select retailers and Nike.com very soon.